I found the Diabetes Online Community through blogs. 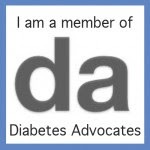 So it seems fitting that the topic for the first day of Diabetes Blog Week is diabetes blogs. The first blog I ever read was C's. And then I found Kim. And Kerri. They were young women with diabetes, living lives a lot like mine. Their blogs led me to others. Blogs of boys living with diabetes (who don't have cooties, after all). Blogs of parents of children with diabetes, who help me better understand what my parents went through. And I've learned so much from my friends living with Type 2 Diabetes. When I discovered the DOC, I'd been living with diabetes for 17 years, and for the first time I felt understood. I finally felt like I wasn't alone. And as my 19th diaversary approaches this summer, I cannot imagine my life without the DOC. Blogs are what started all that. See that REALLY long blog roll over there? I recommend all those blogs because I really do read them. I do my best to read every post. There are so many dblogs out there, that it's impossible to keep up with all of them. So I read what I can, when I can. To all my fellow bloggers, thank you. You have changed my life, and what you write helps people every single day. Thank you. And if you're a D-Blogger and don't see yourself on my link list, let me know. The more, the merrier! Absoslutely love this post, Jess. Blogs and friends have changed my life, and I love you all so much. Great post of finding friends. Thanks for giving me cooties. Um, you know what I mean. Wow! Thank you so much for the mention Jess. You are truly one of the DOCs bright lights. Great post as always - look forward to reading all yours this week. Great post, Jess. Thanks for the mention. Finding the blogging DOC was life changing for me! I'm so glad you are here! !